The recent march for science day reminded me of other marches, for a lack clarity in message. Why? Because marketing is all about communicating focused, purposeful messages on a community level. People march in support of their belief in a cause. But large-scale marketing without a clear purpose most often leaves people asking the wrong questions, promoting disconnect and lack of support instead of a distinct message. The most common question I heard (and asked myself) was, “Why was there a march for Science?” Even scientists who chose to not take part were asking that question. The answer seems to be that there was a march because other groups are banding together and marching, which is great. We need that right now. The March for Science website does a decent job of clearing up the confusion, yet, I have to wonder why the long pages of text couldn’t be condensed into one singular message – a tag line, if you will – that clearly communicated purpose? Instead, it’s paragraph after paragraph that eventually seems to lead to a strong desire to keep research funding intact. Thing is, there is a better way to do that. It’s called change, and scientific research badly needs it. Scientists are at the top of the proverbial career food chain, right up there near doctors. Some assumptions they’ve made have steered humanity well off the course of ethical human behavior and natural development. It is time for them to steer it back. The only reasonable way to do that – and keep themselves vital and relevant as professionals – is to change their system. A march is not going to do that. A website is not going to manifest the change needed. But these mechanisms are good starting points, as statements of intent. Those marching for science had a great opportunity beforehand to clearly define and promote a purposeful message, but alas, that common question of “Why?” revealed that there was no clear, concise message. If I was marketing Science, I would promote it as an art. Art and science have much in common. They are both imperfect forms of expression. They both struggle for government funding. They both serve the public interest. They both influence how people think, learn, discover, and interact in the world. I do not always agree with science, but I find it tremendously valuable nonetheless. Scientists are just like you and me, trying to find answers. They work to discover and understand, often for the well-being of all. Why science needs to change is simple. Government funded science must always be in the public interest. Currently, it is not. At present, taxpayer money is used in some scientific studies that undermine people’s well-being. Theirs is a process of questioning and finding proof. It’s imperfect because the proof isn’t always there. When it is, they document it. When there is no proof, they sometimes make qualified assumptions. Sometimes their assumptions are wrong. Even when evidence obviously counters their assumptions, scientists often defend the bad science to ensure they keep their funding intact. That must stop. That is one easy change they can make for the well-being of all. All of us get things wrong on occasion. If we were perfect, what would be the point? But scientists generally try to get it right. And that’s why – if the industry commits to change – science deserves funding. Their work can seem a bit confusing when we read the words of scientists hired by special interests and corporations (I’m thinking of the Dairy-free diets a ‘ticking time-bomb’ research done by the National Osteoporosis Society, an organization comprised of dairy foods companies), when their conclusions show a clear bias or lack of reality. In those cases, it’s clear other interests are ruling the research. That is to say, they are keeping the research funding intact by finding illogical or inhuman ways to reach the desired conclusion. I like to think those instances are rare in comparison to the good scientists offer. If scientists need alternate ways to earn a living, there are surely other ways to do that than taking up the biased charges of corporations seeking to scientifically prove and promote the need for whatever they wish to sell. Like artists, scientists can get creative. They can forge a more ethical way forward. They have so much to offer. The research we rely on, the books we read, the stories that entertain us, the inventions that inspire, and the solutions that help us live well together – much of this comes from science. Science helps us develop curiosity, ask questions, understand our differences and appreciate our similarities. It’s one way we learn to get from here to there, how we learn to talk about life, how we connect. If you agree, download the free poster, hang it, share it, enjoy. 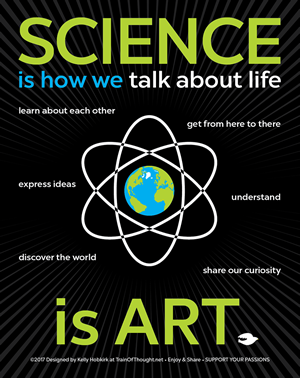 Download the FREE Science is Art poster here.